When you're booking a car service, your top priority should always be to guarantee that your vehicle's safety functions are in sound condition. 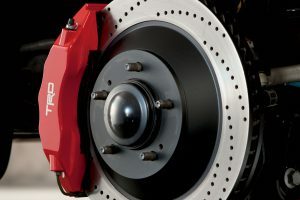 There are many factors involved in making your vehicle trustworthy and a particularly vital component is the brakes. If your brakes are operating strangely they need looking at right away. Some warning signs of brakes that need maintenance are: Brakes that feel soft or "squishy" when you push the brake pedal. A vehicle that drags to one particular side while you are applying the brakes. A steering wheel that rattles or pulses when you are braking. A vehicle that rattles as soon as brakes are applied or a screeching sound that happens while braking. If you are encountering any one of these complications call us here at the Automotive Service Centre and we will organise a brake test and inspection for you. We provide expert brake repair and we look forward to helping get your car braking system restored to it's original condition.